Yesterday, newspapers carried reports on a local builder's plans to come up with a 117 storey, 1450 feet high residential building at Lower Parel, Bombay. Undoubtedly, this plan has stirred up quite an excitement in the city. India has been on the ascendant for some years now. Some may argue China has quite a few skyscrapers, so do Taiwan, Hong Kong, Dubai, Malaysia and the United States. And in view of our new found global status, we ought to have our own skyscrapers in the listing of tallest buildings to establish our rightful place in the world. But if we go by what history has to tell us, we should be very scared now. I am reminded of the Biblical storey of the Tower of Babel. 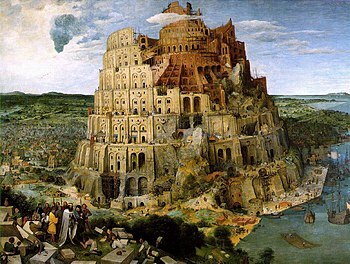 Following the great Biblical flood, people decided that their city should have a tower so immense that it would have "its top in the heavens." And soon, these people got into disarray, spoke "different languages" and ultimately got scattered all over the world. All this pointing to the economic catastrophe the people faced. And whatever was left of the tower was weathered by the elements. Completion of the Taj Mahal (though not a skyscraper by any standard, but is nonetheless equally majestic and grand) in the mid-1600s, which emptied Mughal coffers, was immediately followed by the beginning of the end of the dynasty. On the internet, I came across numerous correlations of completion of skyscrapers and significant downturns in economic fortunes. The website of Ludwig von Mises Institute has an interesting paper titled "Skyscrapers and Business Cycles", which graphically depicts this hypothesis. The story starts in 1907-08, which links the completion of New York's Singer Building with the financial panic of that age. This was followed by the completion of Manhattan's Chrysler Building and Empire State Building with Great Depression of the 1930s. The opening of the World Trade Centre in New York and Sears Tower in Chicago coincided with stagflation and oil crisis of the 1970s. Completion of Petronas Towers in Kuala Lumpur and the East Asian financial crisis that happened in the 1990s, also support the hypothesis. And Dubai's soaring ambitions saw the development of the Burj Khalifa, which was quickly followed by the recent financial crisis, leading to a multi-billion bailout by Abu Dhabi. In the neighbourhood of the Emirates, Saudi Arabia completed the Kingdom Center at Riyadh in 2002, but the Kingdom's fortunes have been wobbly ever since. There are very close parallels with Microsoft's Age of Empires. If you have ever played the game, you would realise that after the civilisation attains a certain level of development, the player has an option to build what is called a Wonder, a grand structure, a relic, a tribute to the grandeur of the civilisation. Most of the civilisation's resources (food, gold, stone, wood and manpower) are deployed to build the wonder, depriving the civilisation's economy from critical manpower for agriculture, sustaining an army, etc. That's when the civilisation becomes most vulnerable to attacks, which can at times be fatal. So what's the inexplicable link between the towering ambitions (pun very meaningfully intended!) and economic crises? The answers perhaps lie in psychology. A certain level of economic development gives planners, governments and corporations a heady, stratified feeling, which is when they head for the overkill, want to leave behind a relic that will be remembered for ages and for generations to come. The focus is lost, resources are mis-allocated, warning signals are ignored. Before anyone realises, the bubble bursts! Now, will the completion of the Shanghai Tower in 2014 mark the beginning of the end of Chinese economic prowess? Already we are seeing signs of trouble coming from China - the yuan-reminbi currency appreciation issue, the property bubble and the Foxconn - Hon Hai controversies. Certainly all this doesn't augur well for the Chinese economic engine. But for now, I will curiously wait to see how the proposed 117 storey tower at Lower Parel affects the Indian economy. Time will tell.